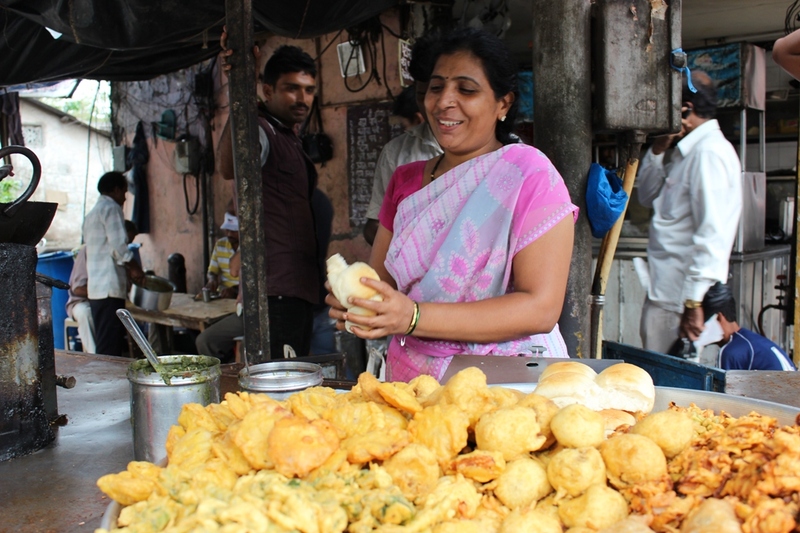 If you head out on a tour of the slums, make sure to ask your guide to find you some Wada Pav (or Vada Pav). These (very) firey potato, spinach and green chilli balls are battered, deep fried and stuffed into a soft doughy bap with lots of even more lip tingly green chilli sauce. Undoubtedly my favourite thing I ate in India! Colaba Social – fun cocktails in industrial-chic surroundings. Step into this bar and you’ll be questioning whether you’re in Mumbai and not Shoreditch, London. Locals, expats and tourists alike flock here to enjoy a delicious, bizarrely presented cocktail in the industrial-chic surroundings. Situated over a dangerously busy dual carriageway from the Pheonix Mall, you’ll have earnt yourself an indulgent treat from simply managing to dodge the traffic alone. Amazing cakes and pastries to enjoy with greats coffee. Beautiful celebration cakes are prepared on order here, and the open kitchen allows for a theatrical performance watching these chefs work their magic. Delicious western-indian fusion snacks, great for lunch. Below is their trendy take on the slum-staple “Wada Pav”, served with curried popcorn! Firstly, apologies for the worst pic ever! My picture might disapoint, but the views from this plush rooftop bar, restaurant and club (the highest in the city) will certainly keep you entertained! Bay View Bar, Colaba – for harbour views. Down on the harbourfront overlooking the gateway to India, is this tucked away gem! Head there for sunset. But be sure to give yourself plenty of time, because it’s hard to find. Ask around at other hotels/bars/locals to get pointed to the staircase that will take you up, and when you think you’ve reached the top keep going another flight for a lovely breezy spot to have a quiet chatter, a cold beer and soak in the views. Originating from a street stall, Badimiya is the go-to kebab and curry house in the area where the basic surroundings let the food speak for it’s tasty-self. This very lively and fun bar, come restaurant serves up an odd combination of indian, chinese and continental food. But the atmosphere and flowing beers make for a fun experience. It seems every corner you turn you’ve got to be making sure you don’t fall over a street food vendor in this city that embraces street life. I can’t, and won’t recommend any particular haunt’s, because it’s more fun to explore and discover yourself. Whether it’s fresh fruit, juices, wraps or a full on curry you’re after, these mean streets will be sure to serve it up to you.